You know what I do not like about restaurant "grand openings"? As mentioned in my Society post, the whole charade is just not worth blogging about. Don't get me wrong, I'm a very honoured to be invited to these events. However, how does one "assess" a restaurant based on an organized event meant to impress people with well-thought out food, outstanding service and drinks? In two words - you cannot. Nothing is representative of the actual operation of the restaurant other than the decor. What it turns out to be is mainly a PR event, which once again, I do not blame anyone. Besides, every company, which obviously wants to be successful and known to potential clients, will need to do what it can to promote themselves. Absolutely necessary and completely fair. Just not a good way to get a real feel of the operation. So here we were, Mijune, Kim and myself, at the grand opening of Preston's. An interesting event which I have chosen not to blog about due to my aforementioned rant. Now once we left, it was a quick jaunt over to Robson for some desserts! 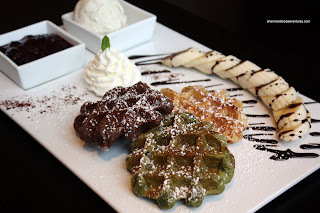 We made it out to Michi Waffle & Espresso Bar for some treats, drinks and humorous banter. Now, I threw something out of left field just before we entered the place. Prior to the grand opening, I had dropped by Bonchaz and picked up some treats for everyone. So we had these cold Bonchaz sitting at our table while we waited for our order. 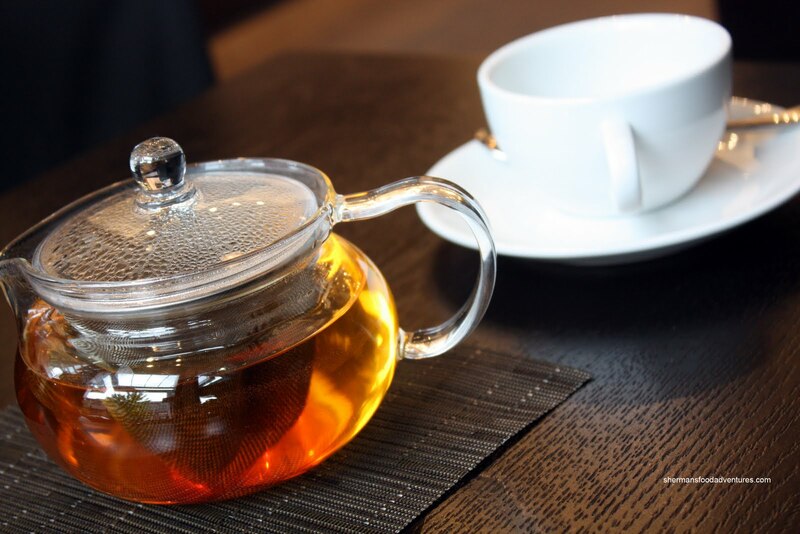 Mijune, being the bold woman that she is, walked over to the counter and asked if they could warm them up for us. Not only did they oblige, they plated them as well! Talk about service! Kudos to them... Definite brownie points here. As for the items we were supposed to be eating, it arrived shortly after. Presented on a large platter, we had 3 types of waffles - Chocolate, Original Liege and Matcha. Included was a sliced whole banana, vanilla gelato and blueberry sauce. 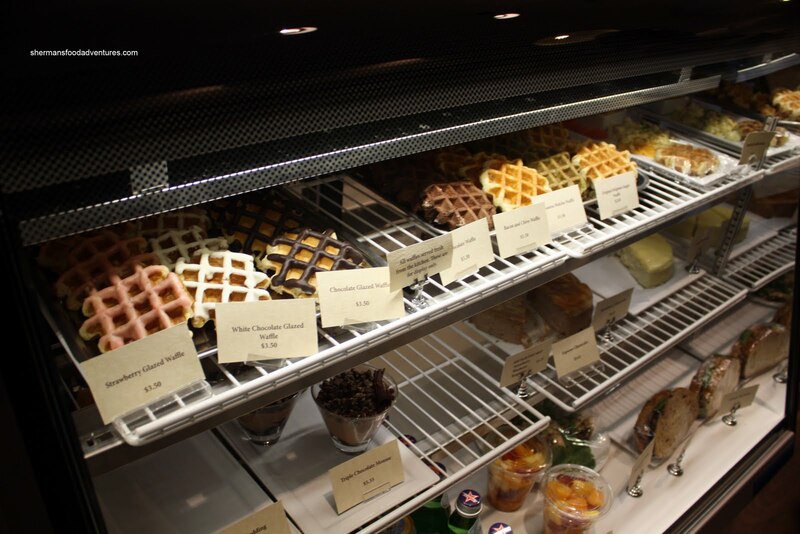 One thing that I noticed right away was the density of the waffles. Unlike the ones at Cafe Medina, the ones here were heavy and doughy. Not horrible; yet definitely not light. Maybe this would be tough with a premade waffle; but I would've liked them to have some crispiness as well. 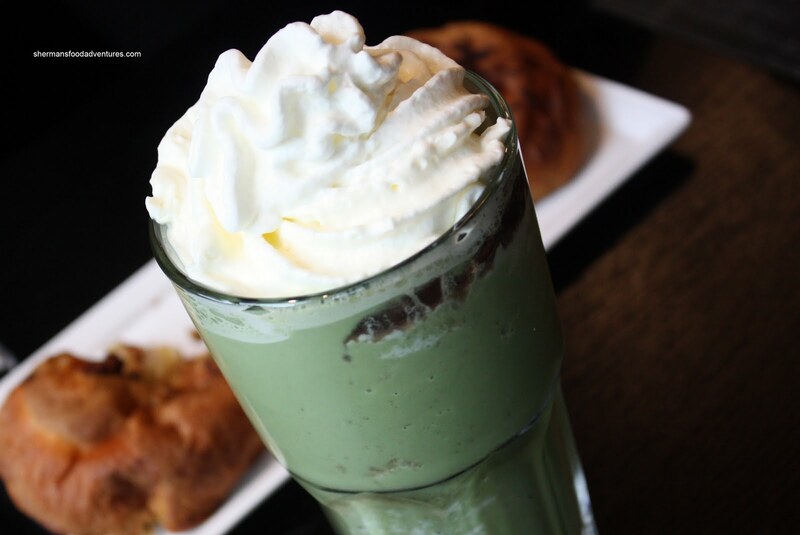 Tastewise, I liked the chocolate and the original better than the matcha. Maybe I was expecting more flavour due to the rich green colour. Admittedly, I'm not much of a dessert person, so it probably takes a lot to wow me. 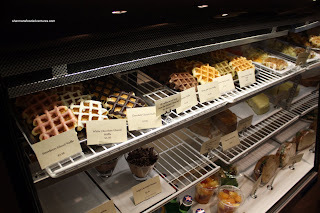 So, the waffles here were okay; but certainly not worth the money personally. I can see how someone, who actually likes desserts, not blinking an eye and paying these prices. 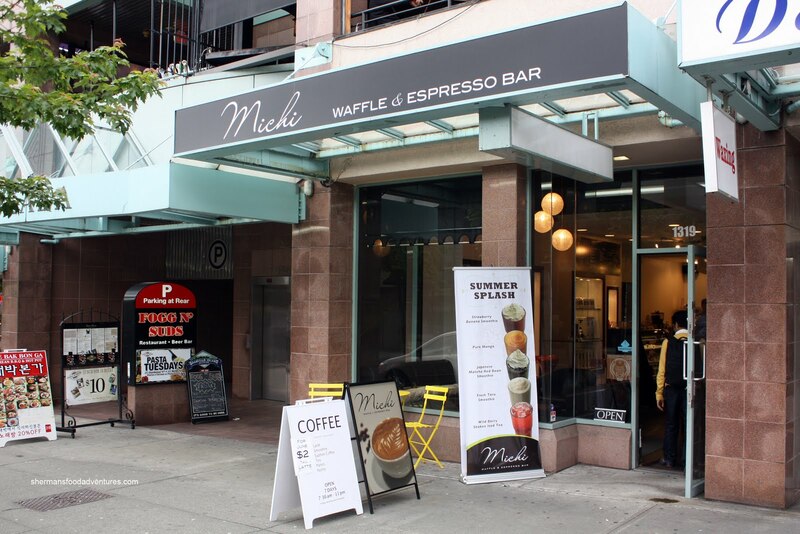 Afterall, Michi is located right on Robson with trendy decor, pleasant staff and a unique product. That may be enough for some people; but its just not for me. I'm more curious about what you think about the buns from Bonchaz. Personally, I've had a couple of samples and was not tempted enough to buy any because they're not that different from chinese buns, which are a lot less expensive. Trisha, they aren't cheap at all. Yah, you bring up a good point. Even Cafe Medina has premade ones too. Probably more convenient? Not sure. I prefer fresh ones too. I am bold lol...but they were better warmed up huh? Yeah most places are pre-made waffles huh? I think the premade ones at Cafe Medina are made to-go but if you sit down they give you fresh ones. Mijune, yah, that is nice to have fresh ones. I did think the ones at Cafe Medina were better. Probably because they were fresh then. They used to make the waffles fresh every morning at Michi, but it was hard to anticipate how many they would sell that day and would end up throwing away a lot. It's unfortunate, because they were twice as good, but it wasn't efficient or economical. It takes hours for the dough to be mixed and to rise...it was just too much work.